The Nov. 23 election in Venezuela to choose hundreds of regional and local officials is an important one. Since 1999, the country has been in a tug-of-war between the governmentís attempt to implement sweeping social programs and the oppositionís resistance to those reforms. 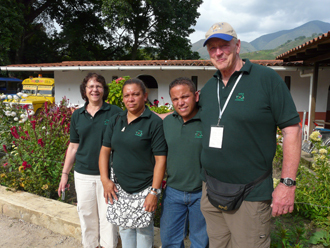 I visited Venezuela on a mission awareness trip last May. Most Americans would be hard-pressed to recite any facts about the country aside from knowing its president, Hugo Chavez. Venezuela has the highest minimum wage in Latin America ($370 a month), relatively stable unemployment and gasoline that costs 15 to 20 cents a gallon. But Venezuelans face many challengesórising inflation and escalating crime, to name two. ìRobbers will take blenders, toasters, anything they can find, and sell them for money,î said Teresa, a CFCA mother whose 19-year-old daughter, Leidy, has been sponsored for 18 years. I chatted with Leidy and Teresa in their modest, stucco home with cement floors situated in a high-crime neighborhood of Barquisimeto. 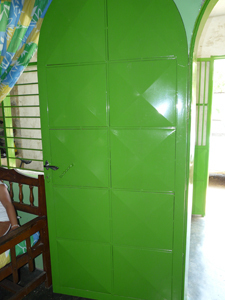 Over the years, sponsorship has paid for improvements, such as a heavy, metal door, to secure the home from intruders. Sponsorship supplements the income Teresa earns working six days a week at a pediatric hospital. She is scheduled to work every other month so the hospital wonít have to pay her health benefits, she said. Her husband fixes cars. Leidy studies information technology and wants to work as a programmer after she graduates next year. She is so petite, I mistook her for a young girl of about 13 rather than a young lady of 19, but she is poised and mature. This hard-working family exemplifies many of the families I met during my trip. I pray for peaceful and fair elections Nov. 23, and that Teresa, Leidy and all Venezuelans may work together for safe communities and a prosperous future. For sponsored children and their families, sponsorship benefits include education, health, help with housing, a loan program and a variety of livelihood training courses such as sewing, knitting and hairdressing. Children who have trouble in the regular school system receive special attention, tutoring and care. 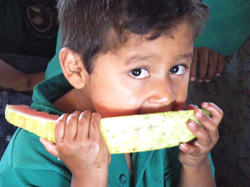 The CFCA sponsorship program offers after-school care and learning opportunities. Mothers who complete the beauty shop course are able to set up their own salon at home. Mothers who complete the sewing courses can apply for a no-interest loan to purchase a sewing machine and begin their own business. The CFCA center also offers domestic violence counseling and support. ìThe economic situation is out of control in our country Ö many times we are unable to offer the families what we have planned in our yearly work plan. This is the result of the urgent need for food. 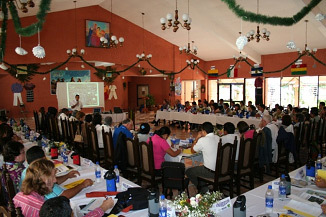 Our main products now cost too much.î Tamara Quinteros, CFCA Coordinator, Santa Cruz. It was Enriqueís interest in electrical workóhe likes to fix electrical fans as a hobbyóthat spurred Annette and Roger Mackenroth of Maplewood, Minn., to sponsor him in 2003. Roger is a retired electrician for the railroad. Enrique, 16, lives with his mother and brother in eastern Venezuela. His father is gone for long periods of time working on a boat. Roger and Annette learned through Enriqueís letters that he was having trouble in school and had to repeat classes. 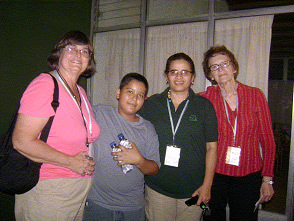 Annette (far left) and Roger (far right) Mackenroth met with their sponsored friend, Enrique, and his mother in Venezuela. 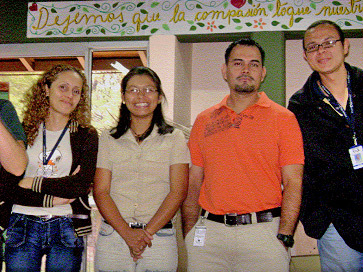 The couple met Enrique on a mission awareness trip to Venezuela in 2007. Enrique and his mother rode a bus for 15 hours to reach Barquisimeto in order to see the Mackenroths. The couple is convinced their encouragement helped motivate Enrique to improve in school. 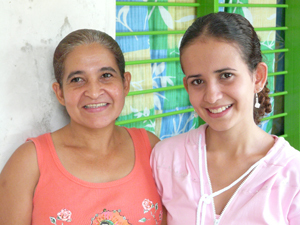 The Mackenroths recently began sponsoring 18-year-old Germarys, also from Venezuela. She graduated from high school in 2007 and then lost her sponsorship. Annette hopes by sponsoring her, Germarys will be able to attain her dream of becoming a lawyer. Maria reads slowly and stops periodically to show them the pictures. The story is short. She finishes in several minutes. When she is through, she asks the children to use their imaginations and write their own story about a goblin. Maria, 17, a CFCA scholarship student and sponsored member, helps out with the El Trompillo reading group every Saturday morning. The group was initiated by another scholarship student, Rodrigo, 19, to help the young students improve their reading skills. The reading group fulfills Rodrigoís and Mariaís service requirement for their scholarships, and it provides a valuable benefit to the community. One young student, Yerlianny, 9, proudly displays the story she has written along with a drawing of her goblin. 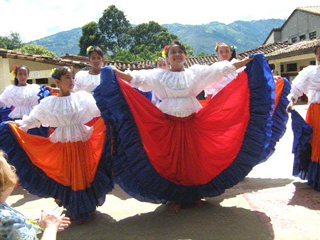 Read more about the El Trompillo reading group and the scholarship students of Venezuela in our August Update newsletter.